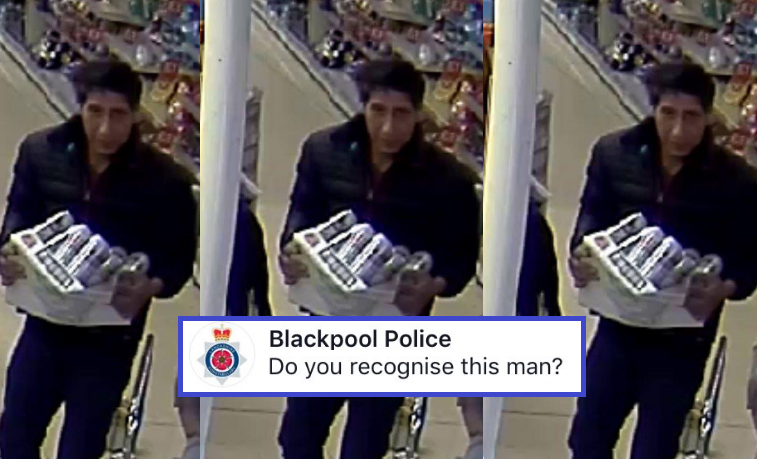 The internet went into overdrive after Blackpool Police posted a wanted picture on their website in relation to a thief who stole some cans of lager from a restaurant a few weeks ago with the question: ‘Do you recognize this man?’. The reason for the great number of replies was because the person in the image looks like the spitting image of Ross Geller, one of the stars of 90s sitcom Friends. This response however just invited more fans of the iconic series to join in worldwide. By the end, the police received help from about 50,000 internet users. We have gathered some of the funniest responses. Nick Croston: "I don't think it's been this guy's day, his week, his month or even his year." Olly Byrne: "I'm surprised you've not found him… it's like you're always stuck in second gear." Jay Murdoch: "Apparently the police had him cornered then he performed a pivot maneuver and escaped." David Schwimmer starred as Ross Geller in the iconic series ‘Friends’ from 1994 to the show’s finale in 2004.